When a developer announces a new project, expectations are always high that the project will go through smooth sailing. Of course, there are times that projects are revised, downscaled or even cancelled altogether. In this update, we will look at some projects that were either downscaled, revised or cancelled and how sometimes waiting years for another project is always worth the wait, as usually something better gets proposed. Also, a shoutout to Mtlurb/Skyscraperpage, both sites which we visit daily to follow these projects and see updates. I will link the threads and sites as well. I remember my excitement at first when it was announced in 2008 that Waldorf-Astoria would build a massive high-end hotel downtown. It would’ve added more prestige to Sherbrooke street and another hotel for the city is always good. The project would’ve had 250 rooms and 76 high-end residences as well and was expected to finish by 2011. Unfortunately, the project was announced at the wrong time, as the Montreal market wasn’t ready for high-end luxury apartments and hotels and this specific project kept getting delayed until it was announced a few years ago that this project was cancelled, along with other Waldorf-Astoria’s projects as well. Perhaps we will see this or a different project arise in the hot market today. The first project was announced in 2007 and revised in 2012 with UniVerse, consisting of two towers of 35/45-floors, an outdoor garden and a small office block as well. The tallest tower would measure at 130m, but no height was given for the second tower. After a successful pre-sales, the project was suddenly cancelled, citing oversaturation of the market. In 2013, we saw a new project arise, 701 University/St. Jacques. 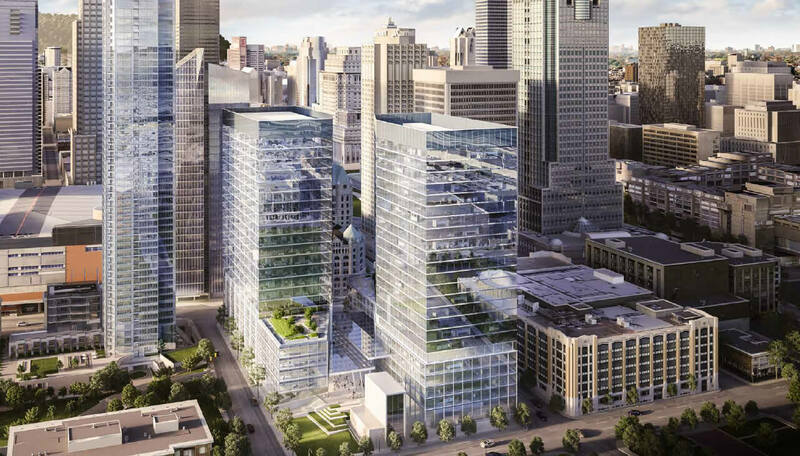 This project would’ve seen two office towers being built of over 720,000 sq.ft class A office space. I also posted a picture of this in 2016 during Montreal en Future, an exhibition showcasing future projects. It was actually close to being built when it was rumoured then, Standard Life would be the anchor tenant in the building. Unfortunately, this project never saw the light of day when Standard Life merged with Manulife and they moved into Maison Manuvie. 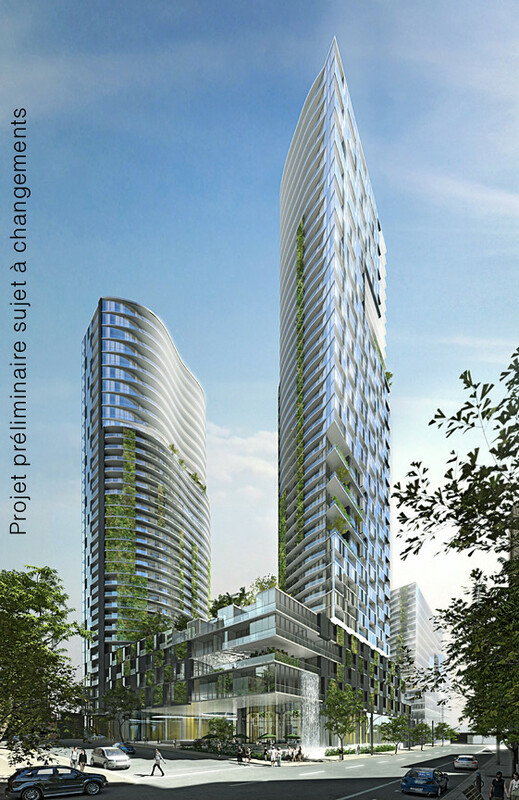 After years of waiting, in 2018 we saw the proposal and now what would be two 200M towers rising up in this area, National Bank’s new HQ and Victoria Sur Le Parc. It was definitely worth the wait. I remember seeing this for the first time and how everyone on SSP/Mtlurb went absolutely nuts. This was back in 2014 and I remember seeing this and saying “holy crap, no way”. It was rumoured to be 52-floors and around 200-210M at the time. Unfortunately, this was just a rough proposal and Cadillac Fairview opted for this version. This version consisted of two skyscrapers, one 180M tower, the other 130M. The sqft of the project remained the same at 1.1M sq ft and Cadillac Fairview got approved to built higher in the Northern lot. Unfortunately, the project got downscaled once again, going from a beautiful curved glass building to two small boxes. The new project, while still the same 1.1M sqft, is now two 23-floor towers that look around 110-120M tall. It is rather strange that CF would downscale the project when the office market is the hottest in decades, but we’ll see once an announcement comes. 4. 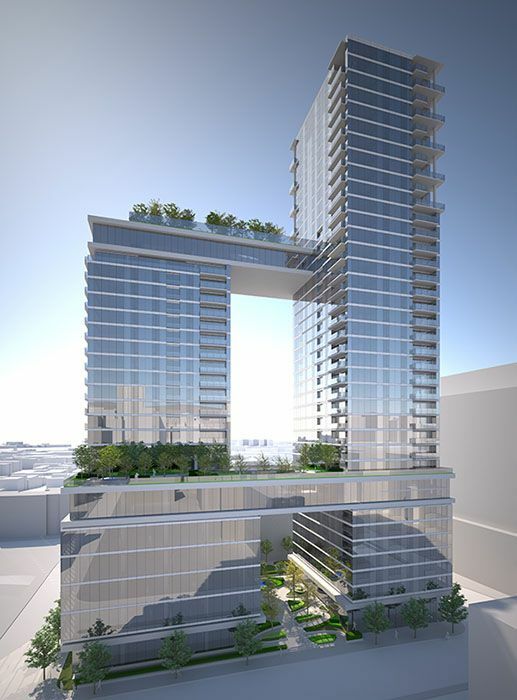 1215 Square Phillips office project (2007-2017): 33-floors, cancelled. This project kept bouncing around during the development process. From 25-floors to 40-floors, then 33-floors and was around 700-900,000 sqft of office space. Again when announced, it was when Montreal’s market wasn’t as strong, especially for office towers. 900,000 square feet for a city that up until the completion of Deloitte, didn’t see any other office towers in two decades (privately built). 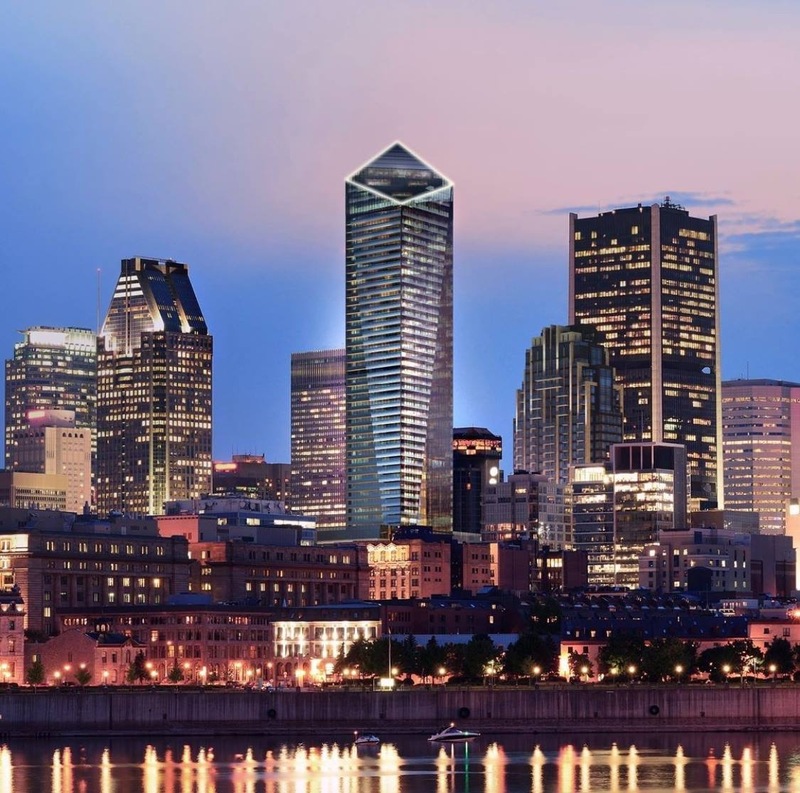 I’m sure Montrealers who passed by Square Phillips saw the sign that said “for lease, new office tower up to 900ksqft). This project never saw the light of day and in 2018, Canderel sold this lot to Brivia group (YUL, Quinzecent, Nest condos) for $45million. Brivia is currently developing a massive project that hasn’t been announced but will be one of the tallest towers in the city and will be condos. I’m actually sad that this project never saw the light of day (not as sad as the original 750 Peel). This project was unique with having two gardens suspended above each other. High-quality materials, the gardens and architecture that you would see in a city like New York, it was sad that the project never went through. 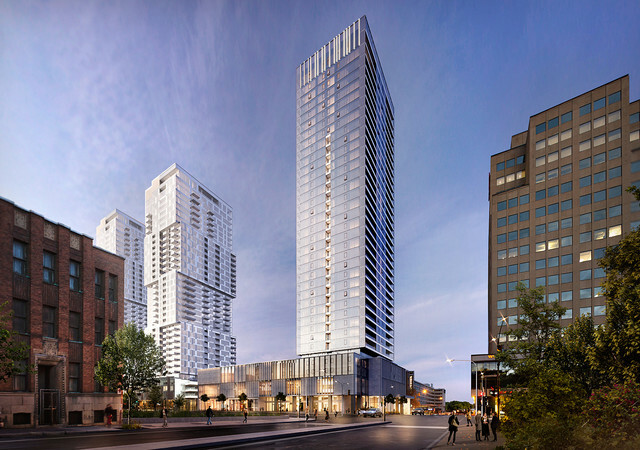 It would’ve integrated well with YUL, Holiday-Inn and the new projects around this area of town, but again the project was announced when the market wasn’t fully ripped. After years of inactivity, Brivia group bought this land next to their YUL project and announced Quinzecent. These are five projects that never made the cut and were either downsized or replaced all entirely. Sometimes it is worth the wait, and sometimes it’s not. Of course, there are man other projects that were cancelled and modified so I will link everyone to Skyscraperpage, Mtlurb and a post I made in 2016 showing projects that never made the cut. It’s very interesting because if those projects went through, our city would be much different today. 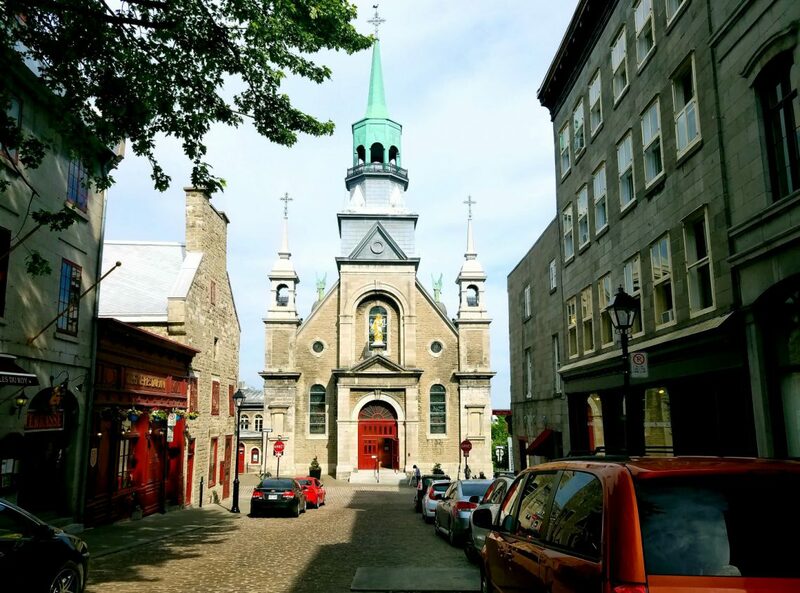 Previous The downtown experience: why people are moving to downtown Montreal.